The past few weeks I have been reading through 1 and 2 Chronicles. I used to not really like studying the lives of the kings of Israel because honestly, I found them quite annoying. I mean, what was wrong with those guys? They just couldn’t seem to stay on track! There would one good king who would follow after the Lord with all his heart and after that would be 2 or 3 bad ones who would cause the whole nation to turn away from the Lord. They never seemed to be able to learn from the mistakes of those who went before them and it was almost like they wanted to bring trouble upon themselves. Recently I have begun to gain a bit of a different perspective as God has been challenging me to see myself in the lives of those kings. It hasn’t necessarily made me like Chronicles more but it has certainly been eye-opening as I am learning that often I am a lot like those kings that I found so annoying! So many times, I make the same mistakes over and over, refusing to listen to the Lord’s voice and instead becoming focused on myself, my wants, desires, and will. One verse that really stood out to me was 2 Chron. 12:14 which speaks about the downfall of King Rehoboam. It says, “And he did evil because he had not set his heart on seeking the Lord." I noticed that seeking the Lord seemed to be the missing piece for those kings who went astray. Whether it was wealth, security, relationships or their own pride, somehow their focus was turned from following the Lord to going after their own ways. I was reminded of the importance of keeping my focus in the right place when I had the opportunity to go horseback riding a few weeks ago. For horses there are so many possibilities for distraction when out on the trail. There are spooky holes and strange objects along the way, green grass to stop and eat, pesky flies and birds that come up out of the middle of nowhere. 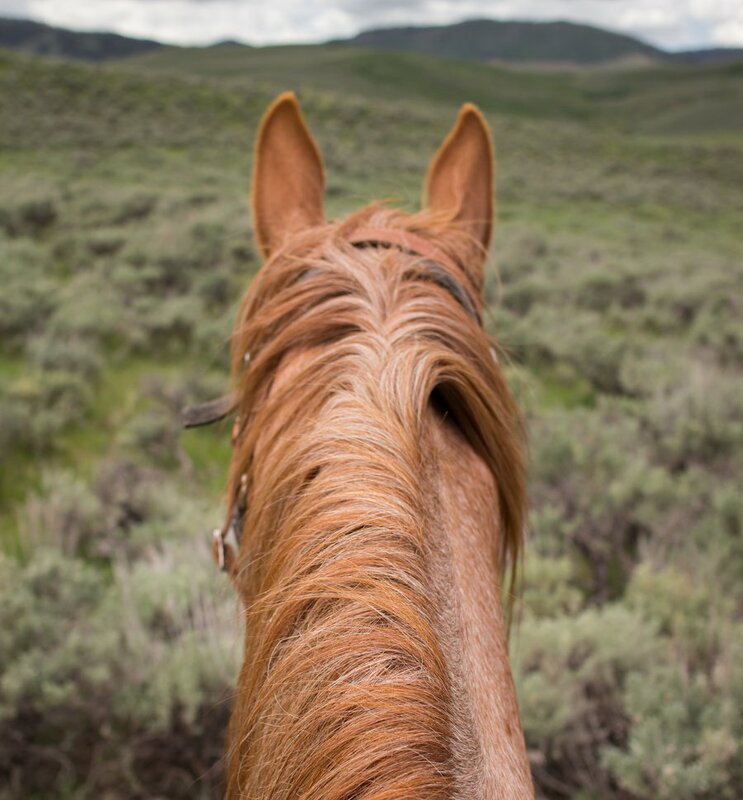 If a horse is well trained it knows that it must tune out everything else and focus in on one thing only, that is the cues that it receives from it’s rider. These can be verbal cues or physical touch, but it must be fully in tune with its rider in order to not miss the cues when they come. In my experience, the person I was riding with had spent a lot of time with her horse so it was well trained and sensitive to the voice of its rider. My horse on the other hand was older and hadn't been ridden much for several years. She was constantly wandering off track and seemed to be dulled to my commands. Her mind was only focused on one thing and that was getting back home so she could be free of her rider and go back to enjoying her horsey life! In my own life God has been showing me that in order to not get turned aside by the many distractions that try to pull my heart away from Him I must stay sensitive to His voice and be attentive to His cues. These can come through spending time in His Word, being with others who are also seeking after Him or simply while in the day to day activities of life. If my heart is consumed with my own plans and desires it becomes so easy to wander off track and be dulled to the voice of the One who is leading me. God desires that I am continually walking in His presence in order that my heart might remain sensitive to His voice and leading. Going back to Chronicles and the lives of Israel’s kings, I am encouraged to remember that no matter how many times I fail or refuse to listen to the Lord’s voice He never fails to draw me back to Himself. 2 Tim. 2:13 says “If we are faithless, he remains faithful, for he cannot disown himself.” I am amazed by His abundant mercy and grace towards the Israelites. When they turned their hearts towards Him and began to seek His face He was always faithful to answer their cry. He could have just said that they deserved the trouble they got and left them in the mess they were in , which is what I would've wanted to do. Instead He promised that when they would humble themselves and seek His face, turning from their wicked ways, He would hear their cry and forgive them. I am so thankful that God in His mercy never leaves me where I am at but is continually working in my life to shape and mould me into His likeness.